Not only that the adventure game bags the highest grossing and PC game in the previous year; Fortnite has now seen even a wider accomplishment, bagging the highest grossing iOS game as well. Trust me, if you know what it means to have a massive iOS adoption, then you would know rightly, that Fortnite has really made a great impact in the shortest period of establishment. Fortnite is the first game to surpass $500 million in revenue in under a year, beating previous record holder Clash Royale by 16%. Meanwhile, on Android, they reached $100 million in the same timeframe. On average they generated $1.53 million per day on iOS and $0.31 million per day on Android. Epic’s bottom line looks rather different from that, of course. Apple claims 30% of all revenue the app generates, or about $150 million. On Android, Epic was able to bypass the Play Store and keep all their profits, which makes for a total of $450 million in the bank across both platforms. 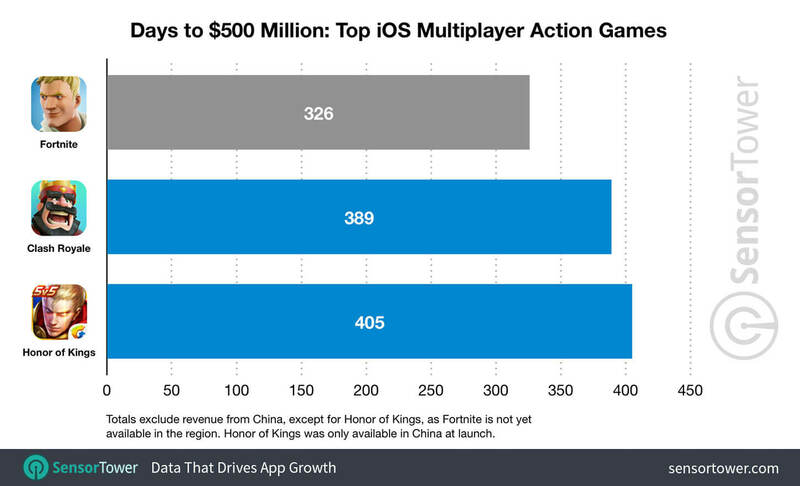 While the game is been played mostly by Americans, it still manages to top the chart as seen in the image above; accounting for up to 64% of spending on iPhone and other iOS devices; $320 million. Sensor Tower hasn’t specified the geographic distribution on Android, but it’s probably less skewed towards the U.S. because the platform tends to be more popular worldwide. While the rush is coming to Fortnite lately, My own candid advice is for the company to make reasonable use of their current stardom and possibly put their incomes into productive use.